At the helm of the project is Free Black Dirt, an artistic duo made up of Junauda Petrus and Erin Sharkey, who have been friends for close to 17 years. Writers, community-focused artists and rabblerousers in their own way, the two have collaborated on everything from theater projects to cultural competency training to arts programming at libraries and art centers. “Our dynamic is that we are both resourceful and brave,” said Sharkey. She co-produced the project with Petrus, who wrote and directed the series. Filmmaking is just the latest chapter in Petrus’ varied career. She’s been an aerial artist, playwright, poet, activist, and has a young adult novel coming out next year from Dutton. She said the seed for “Sweetness of Wild” sprouted when a filmmaker friend, Rachel Summers, asked her to write a screenplay for a short film a few years back. 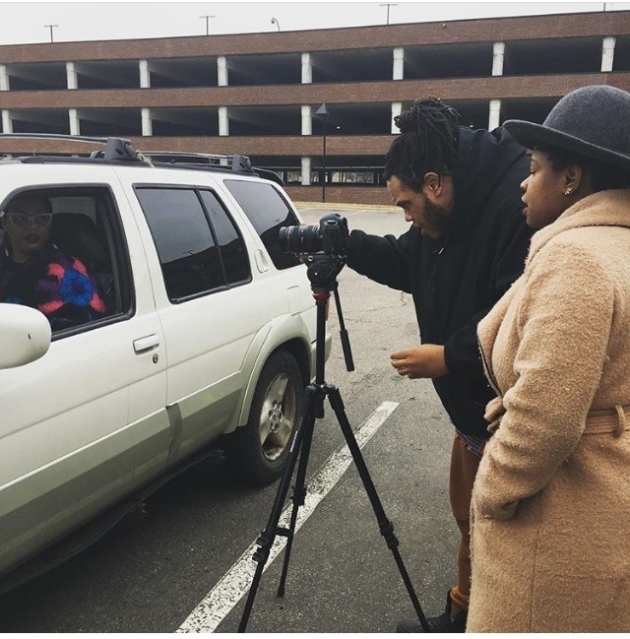 That’s where she first worked with cinematographer and musician Mychal Fisher, of the band Astralblak (formerly ZuluZuluu). Petrus caught the filmmaking bug, and brought Fisher along on the new project. Fisher said his task was to capture the magic that Petrus instills in the script. His camera lingers on the actors’ faces, allowing moments to evolve, sometimes without dialogue. Mychal Fisher filmed a scene with Fanny McCorvy, left, and Junauda Petrus. 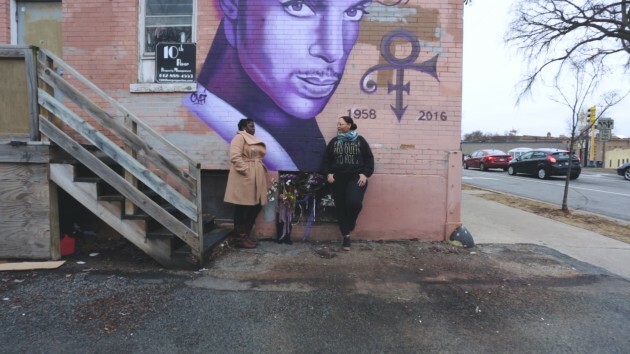 The series’ first episode, “Purple,” features two women mourning the death of Prince. We see Mystic (Fanny McCorvy) sitting in a bathtub. She’s joined by Alma (Andrea Pierre), who passes her a joint as they reflect on Prince’s passing. The video progresses in a dream-like fashion, in Alma’s home and in a park setting. Part ritual, part philosophical discourse, part sensuous meditation on black queer relationships, the story takes its time, allowing viewers to get to know the characters and relationships through nuanced performances, Petrus’ bewitching, often provocative writing and Fisher’s sensitive camera work. Another episode features a lengthy intergenerational dance sequence that showcases the joy and exuberance in a community. We see the budding romance of a young queer couple. While capturing the two characters' innocence and vulnerability, the episode also suggests the wisdom they inherently know. “It’s my love letter to Black Minneapolis,” Petrus said. There’s a through-line to the series, though it is not necessarily linear. “We are breaking all the rules,” Petrus said. “There’s a really existential turn it takes.” Each episode focuses on different sets of characters, though some characters appear in more than one episode. “The last episode pulls them all together,” she said. A fundraiser for “Sweetness of Wild” takes place Oct. 3 at the Parkway Theater, where there’ll be a screening of several episodes along with Caribbean food (courtesy of Ingridients Caribbean Cuisine), activities and live performances. You can also meet up for a preshow bike ride to the Parkway that starts at Pillsbury House + Theatre at Chicago Avenue and 35th Street. The event is curated by Channy Leaneagh, of the bands Roma di Luna and Poliça, who has known Petrus since high school. Leaneagh, who will introduce the night and lead a Q&A with the artists, said when she was asked to curate an evening of cinema at the recently renovated Parkway, she thought of Petrus’ project. “I’ve been admiring her artistry, her brilliance, her survivancy and her activism since we were kids,” she said. While it felt a bit foreign to curate an evening — usually she's the person that shows up to play — Leaneagh said she’s excited to be bridging the Parkway and Pillsbury House, a vibrant arts and community center, via the pre-show bike ride, which starts at 6 p.m. When: 7 p.m. Wed., Oct. 3, Parkway Theater, 4814 Chicago Av. S., Mpls. $10-30, 612-822-8080, theparkwaytheater.com.